TRANS PACIFIC 1940's - THE STORY: It was the golden age of aviation and nothing held the imagination more captive then the ultra luxurious trans-Pacific Clippers. They were giant flying boats with fixed wings and massive hulls that allowed for long distance travel and landing on water. The Clippers enabled the first trans-ocean passenger service and ushered a new era for Hawaii tourism. THE DESIGN. 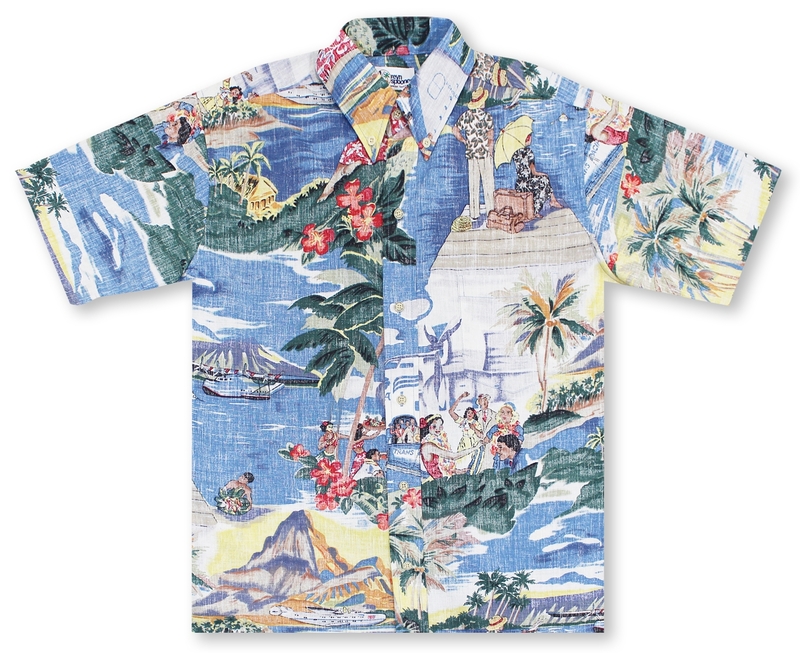 Inspired by iconic Hawaii destination posters of that era, our Trans Pacific 40's print is designed to vividly recall those nostalgic years when both journey and destination were savored in equal measure. It was first released over 25 years ago in Reyn Spooner "Reylon," and it quickly became of one of the most requested reprints in subsequent years. The first Spooner Kloth fabrication, however, was released 2 years ago after a long hiatus.